Why does midfoot arthritis happen? Arthritis is when a joint wears out. The cartilage that is attached to each bony side of a joint begins to break down much like a break pad wears out on your car through years of use. Pain is the most common symptom of midfoot arthritis. The pain is usually localized to the top of the foot over the arch. Sometimes, the arthritis causes the joints to become unstable and the arch falls. This results in a flat foot and sometimes the toes even begin to point to outside of the foot. Bumps caused by arthritic spurs can form. Occasionally, these spurs can pinch the nerves on the top of the foot and tingling will be felt in the toes. If the arthritis is fairly advanced, x-rays will show signs of the arthritis fairly well. The joints are narrow, because the cartilage is worn away. The bones under the arthritic joints will be thickened because of the extra pressure. Spurs (white arrows) will sometimes be present. There are several joints that lie along the arch. These joints are called the tarsometatarsal joint, thenaviculocunieform, and the talonavicular joint. Their purpose is to adjust to uneven surfaces and to store and absorb energy during the step. 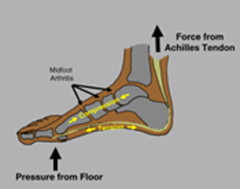 The pressure that is applied to the ball of the foot is transferred into the ankle and body through these joints. For very small joints, they really have considerable force going through them. These joint begin to wear out for a variety of reasons. Trauma can damage them slightly which can begin a progressive deterioration of the joints. Sometimes, the architecture of the foot places more pressure through one portion of the foot causing it to wear. Other times, small amounts of loosening of the joints or slight flattening of the foot can begin the gradual cascade toward arthritis. It is a very common problem especially after the age of fifty. The first step on the road to recovery is to control the pain and reduce the pressure on the forefoot. While midfoot arthritis is common as one gets older, fortunately, it rarely requires surgery. Non-steroidal anti-inflammatory medications such as ibuprofen and naprosyn are effective pain medications,but do little to cure metatarsalgia. 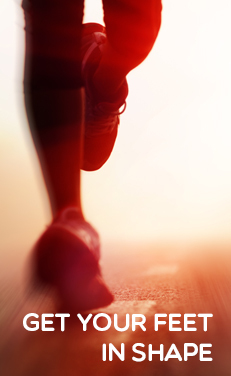 Activities that place a great deal of stress on the forefoot such as jogging and sports may need to be temporarily curtailed and replaced by other activities such as bicycling and swimming. Postural training and rehabilitation is the effective long-term solution. Changing the forces on the front of the foot means improving flexibility, toning the muscles of the abdomen, hip, and back. It also means learning a different way of walking and standing.